Proper watering is the most important thing to maintaining a healthy tree. Recommending an exact amount is difficult due to the variety of climate, soil and type of tree, but a good rule of thumb is to make sure the water soaks deep to the roots and must dry thoroughly between watering. When planting a new tree; water immediately and daily for a week. The first two years are critical in the care and survival of your tree, since the new tree uses a lot of energy establishing its roots in the soil. Dealing with heat and drought make growing your new tree difficult, and making sure your tree gets the proper amount of water is essential. Giving your new tree too much water is a common care mistake. Giving too little water is just as bad. A great rule of thumb is the soil around the tree should be moist and not soggy. A moist soil allows oxygen to get to the roots of the tree. There are several tree categories. Tropical trees such as Queen Palm, Date & Purple Plum to name a few should be watered on average 3x a week during the spring and fall temperatures of 85-100, 5x a week during the summer of 100+ temperatures and should be decreased in the winter to 2x a week when the temperatures fall below 85 degrees. Sub Tropical trees such as Fan Palms, Sumac or Live Oak should be watered 2x a week in the spring and fall, 1x a week in the winter and during the extreme summer over 100 degrees in the Phoenix area should be watered every other day or more if temperatures go higher than 110. 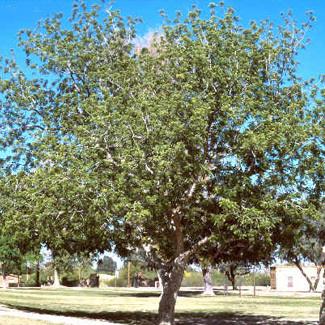 Desert trees like Palo Verde or Native Acacia should be watered 1x a week during the spring, fall and winter and 2-3x a week or more during hot summer months of 100-110 degrees. It is equally important to know the parameters of watering your trees after they have become adult trees or older than 2 years. The Tropical trees should be watered 2-3x a week during the spring and fall temperatures of 85-100 degrees. 4x a week should be done during the hot summer Arizona summers of 100+ degrees and 1-2 x a week during the winter when temperatures fall below 85. The Sub Tropical trees should be watered 1-2 x a week during the spring, fall and winter and 3-4x a week during those hot summers. Lastly, the Desert varieties should be watered 1 x every 10 days during the spring, fall and winter months and may be stretched to 14 days during these winter days and 2-3 x a week during the summer heat. With proper care and watering after two years your tree roots should be thoroughly established. This allows your tree to withstand a wide variety of water conditions because of a solid root foundation.